EVERETT, Wash., Oct. 31, 2017 /PRNewswire/ -- The Everett Clinic, a DaVita Medical Group, division of DaVita Inc. (NYSE: DVA) and a leading independent medical group in the United States, received the Washington State Medical Association's (WSMA) highest award for patient safety in the category of excellence for their chronic opioid therapy work during the organization's annual meeting on October 14, 2017. 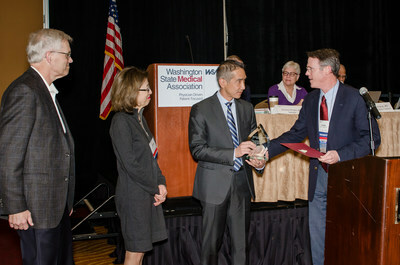 "We are honored to be recognized by the Washington State Medical Association in the collaborative effort to curb opioid abuse within our community," said Dr. Kent Hu, associate director of quality and safety at The Everett Clinic. "We truly believe that we are doing innovative, and most importantly, patient-centric work that honors our commitment to addressing the opioid issues our community is facing." "We have found The Everett Clinic's commitment to improving the opioid epidemic in this community to be innovative and effective in improving patient safety and quality of care," said Donna Smith, MD and president of WSMA. "We are proud to present this organization with our esteemed patient safety award and look forward to seeing how their success continues to drive positive change." The Everett Clinic's internal efforts to curb unsafe opioid prescribing have been very successful; the number of clinical staff adhering to safe opioid best practices guidelines has increased over 45 percent year-to-date, illustrating the organization's dedication to the issue. The internal measures are based on best practice criteria for safe opioid prescribing and include seven individual elements derived from Washington State regulationsi, including pain score, pain inference score, opioid risk tool, morphine equivalent dose, urine drug screen, prescription monitoring program and opioid contract/agreement.ii Each must be assessed for each patient identified as a chronic opioid user.